Windows Vista placed all your laptop’s power button and lid-closing functions in one handy spot. To get there, Choose Control Panel from the Start menu, and then click Power Options to display the Power Options window. Click on the link Choose What Power Buttons Do, located on the left side of the window. You see a special System Settings window, as shown here. 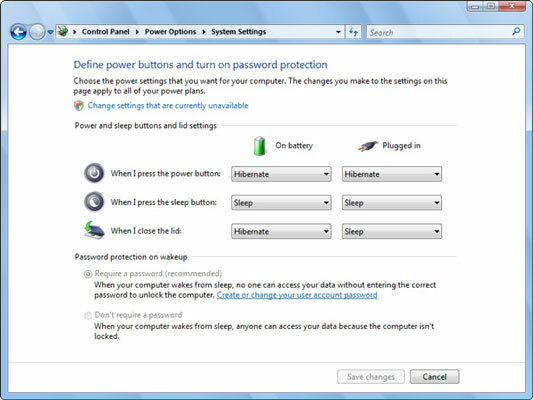 Each button has two options, depending on whether the laptop is running from battery power (“On battery”) or is plugged in. Do nothing: Pressing the button or closing the lid doesn’t change anything. If the laptop is on, it stays on. Sleep: The laptop immediately enters Stand By mode, saving vital battery power. Hibernate: The laptop hibernates, saving important information to disk and then turning itself off. Shut down: The laptop turns itself off. Open the Control Panel’s Power Options icon. Choose the Control Panel item from the Start menu. Click on the link that says Change Plan Settings. The link appears multiple times in the window; you can click on any of the links. 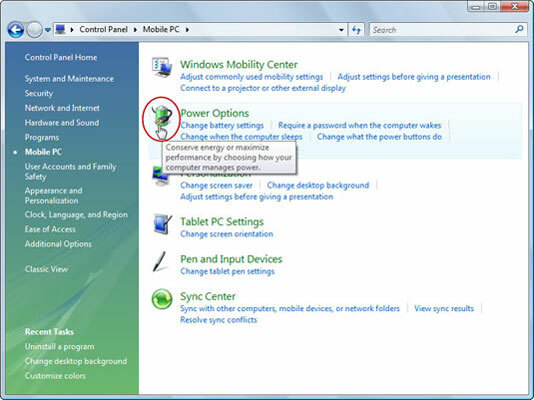 Locate and click on the link that says Change Advanced Power Settings. 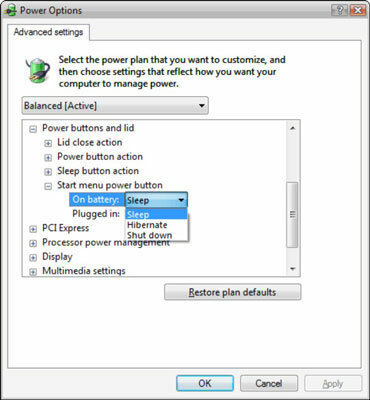 The Power Options dialog box appears — a treasure trove of various power-saving settings in Windows Vista. Scroll through the list and locate the item labeled Power Buttons and Lid. Click on the + (plus sign) to open the Power Buttons and Lid branch-thing. Click on the + to open the item labeled Start Menu Power Button. Two items appear, one for when the laptop is on battery power and the other for when the laptop is plugged in. Choose an option for the Start menu power button. Click on the current setting (shown in blue text) to see a pop-up menu of options, as shown in the above figure. In this example, three options are available: Sleep, Hibernate, and Shut Down. Whichever option you pick becomes the new Start menu power-button setting. Click OK to close the Power Options dialog box, and then optionally close the Control Panel window. The Start menu’s power button thing now functions as you’ve dictated.